FSWT is the forefront of service-oriented excellence and customer satisfaction. Our success is substantiated by more than a decade in the industry. We provide all customers with products that satisfy the ISO 9001 standards and UKAS (United Kingdom Accreditation Service). Striving to be trustworthy, reliable and honest. We are proud to live out these values in an effort to guarantee you peace of mind. Lower Energy Costs – Heat loss through windows can cause discomfort to building occupants and unnecessarily high energy bills. Low emissivity insulating film can decrease heat loss by up to 30%. In warmer climates LLumar Films reduce the cost of cooling a building by rejecting up to 79% of the sun’s heat. Block Heat and Glare – Llumar helps correct temperature imbalances between sunny and shady areas and it deflects harsh, un-comfortable glare. Reduces Fading – LLUMAR filters out up to 99% of harmful UV rays that contribute to fading in fabrics, furnishing and display merchandise. Improves Appearance – Glass treatment films can add new style to buildings and houses for a fraction of the cost of other refurbishments without the inconvenience of relocating tenants or family. 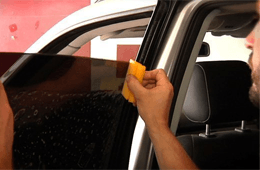 Enhances Privacy – Translucent or daylight reflection films applied to the inside of your windows will let in light but guard against prying eyes. Don’t let the harmful rays of the sun damage your curtains, blinds, furniture or paintings protect it with LLUMAR Window Film.